*This review was originally published at The Film Experience. 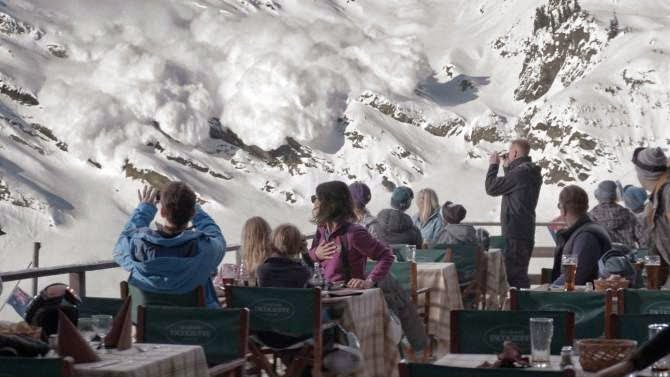 The opening sequence of Ruben Ostlund’s fourth feature, Force Majeure, has an ominous aura to it. On the surface, there is nothing strange about a happy, wealthy Swedish family stopping for a family portrait during their vacation at a posh French ski resort. Yet, as their unseen photographer becomes more assertive with his commands, ordering them to get closer together and forces the corners of their lips upward, something seems amiss. No sign of trouble is yet to be found though, as Tomas (Johannes Kuhnke), Ebba (Lisa Loven Kongsli) and their white-as-snow children spend the first couple of days skiing together. It is during lunch at the high-end restaurant on the balcony of their hotel that everything falls apart at the seams, revealing the tenuous links that keep this family – or is it every family? – together. Tomas insists that the loud bang and the ensuing avalanche are controlled by resort patrols, but when panic strikes all diners, it is he who abandons ship first, opting for his own survival as he runs away from his family. When this blink-and-you’ll-miss-it pivotal moment in the narrative is over and the snow powder settles, Tomas is overcome with shame but returns to the table as though nothing out the ordinary has happened. For Ebba and the children, however, the gravity of the mistake makes it unforgivable. As the vacation progresses and the story of that fateful moment is repeated between Tomas, Ebba and their friends, perceptions change, stakes are raised and bonds are severed and mended again. The avalanche has hit the family like, well, an avalanche; though the analogy only feels forced when articulated by the reviewer, not when the director slyly works it into the film. Ostlund tells this story with a remarkable panache for minimalist style and minimalist storytelling. The snow-covered background affords him the possibility to concoct some of the most memorable images and sounds of any film this year, but more impressive is how he replicates the same clean, sparse atmosphere in his storytelling. With a keen eye for small interactions between characters, Ostlund manages to say quite a lot while saying very little. Note one particular instance, where an uncomfortable Brady Corbet (unexpectedly brilliant in a tiny role) is asked to adjudicate between Tomas and Ebba. Ostlund has been similarly preoccupied with awkward group encounters in his previous films, and here, holding the camera as a taciturn Corbet nervously fidgets around in his seat to avoid delivering responses, he proves his knack for capturing truthfully these small but crucial interactions. Force Majeure is about our perceptions of each other, the image we project of ourselves, and our differing perspectives, and above all it’s about how easily breakable all of these things are, how friendships and relationships and even familial bonds can be broken with one moment’s worth of complete idiocy. Then again, how stupid really is Tomas’s mistake? Can a single momentary slip break everything? Whose perspective do we accept as the truth? Ostlund toys with these questions without offering definite answers, knowing well that there can be none. If anything is definitively claimed, it’s the vulnerability of man and his position in the traditional family structure. For all its pretensions of power and control, no institution is as fragile and easily bruised as masculinity. Kuhnke’s performance as the man crumbling under the weight of his own self-image and perceived infallibility is perfectly pitched to the film’s sense of humor. Ostlund’s comedy is dry and detail-oriented. In several instances, it is only the framing of a character, or a split-second cut that causes uproarious laughter. It is an absurd sense of humor, too. Consider that the film’s biggest moment of comedy gold is delivered not by an actor, but by a remote controlled toy drone. Only in the hands of an extremely confident director like Ostlund can such storytelling succeed. After a couple of minor festival hits, Force Majeurehas now entered him among the world’s most exciting filmmakers.